"Martin Construction provides very competitive prices. Their prices always seem to come out just a little bit better." The Kaiser-Martin Group can provide a complete racking system for your cold storage building. Your choice of an industrial rack system will affect the profitability of your operations. Rely on KMG for a variety of racking solutions for your cold storage or warehouse building including Selective, Flow, Pushback, Double Deep Selective, and Drive In / Drive Through racking systems. Our decades of experience in Cold Storage Building Construction have made us the authority on refrigerated warehouse construction. This is why The Kaiser-Martin Group is the preferred cold storage construction contractor in the Northeastern U.S. The Kaiser-Martin Group is the Premier Construction Contractor of cold storage facilities also known as refrigerated warehouses. This type of refrigerated construction is unique, specialized, and requires specific knowledge and experience to be performed successfully and efficiently. The Kaiser-Martin Group has been building cold storage warehouses for over twenty years and has a large amount of knowledge and experience in this type of cold construction. We also have extensive experience in the construction of food preparation facilities. Call The Kaiser-Martin Group for the construction of your refrigerated warehousing, freezer space construction, and dry storage food warehousing construction to have it built right. We are qualified to build for you because we have spent years working with USDA regulations and requirements and know the appropriate construction methods to satisfy them. Our products and construction methods are second to none. The Kaiser-Martin Group refrigerated warehouses are becoming the gold standard in the industry. We can help you with the entire food warehousing or cold storage construction process from land development, drawings and diagrams, through to construction. The Kaiser-Martin Group self performs the construction and handles code approvals for your cold storage building. This includes thermal and vapor barrier systems needed to efficiently run cold storage facilities and food processing and distribution buildings. We understand the details of refrigerated warehouse construction such as thermal breaks, vapor barriers, layered concrete. These details are familiar to all of our employees because we have been design-building for decades. You are close to the material source because The Kaiser-Martin Group orders the materials from the manufacturer such as steel, panels, liners, roofing, and accessories. These components have not been marked up several times by the presence of a middle man. Our years of experience in cold storage construction has made us an authority on the subject of refrigerated construction. 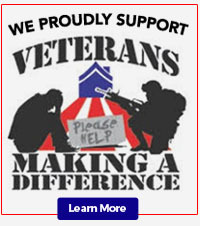 This is why The Kaiser-Martin Group is the preferred cold construction contractor in the northeastern U.S. The Kaiser-Martin Group is based in Temple, Pennsylvania and will pursue steel construction work opportunities in the eastern United States. We will build in Pennsylvania, New York, New Jersey, Vermont, New Hampshire, Maine, Rhode Island, Connecticut, Delaware, Maryland, Virginia, and West Virginia. 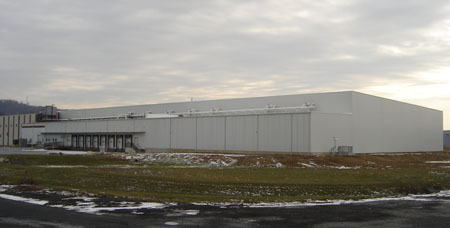 The Kaiser-Martin Group builds refrigerated warehouse construction with high-quality insulated metal panels. These panels consist of two metal skins filled with 2" up to 6" of urethane insulation. Assembly of this panelized construction system is quick and efficient. R-Values of insulated panel construction are from R-16 up to R-49. Panels lengths can come in 10' up to 48' with interlocking, double tongue and grooves. The exterior face consists of 26, 24, or 22 gauge G-90 galvanized pre-painted steel. 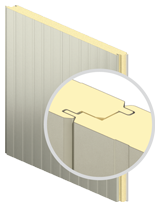 Insulated panels have high fire resistance ratings and have USDA approved finishes for food environments. The Higher "R" Values and uniform insulation thickness of insulated metal panel construction help bring lower operating costs to your facility. Since the panels don't compress like blanket insulation your "R" value will not change over time. The insulated panels rigidity mean less steel is needed to support them because they can span longer distances. We can provide refrigeration systems for supermarkets, convenience stores, restaurants, warehouses, food processing facilities, and manufacturing facilities. We can build cold storage space for environments from -20 to +34 degrees. We can provide 24 hour monitoring of your cold storage facilities. A sophisticated program monitors various levels of your facility including high or low temperatures, oil failures, open sensors, lighting, short cycling, and power failures. Our customers appreciate how we were founded on values of honesty and integrity and continue to use our services because of this. We know that you can be confident in The Kaiser-Martin Group to build your next project no matter the size or complexity. We have the knowledge, experience and values to ensure that as we work on your next project you will be thrilled with the final result.